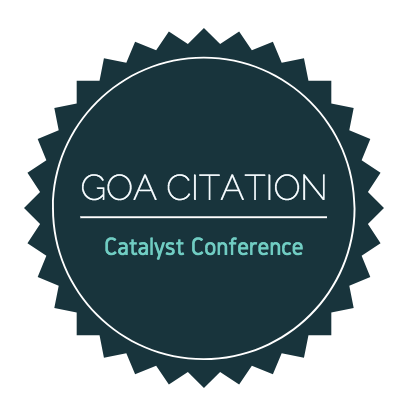 GOA Catalyst Conference » A Natural Gas Energy Future: Promise or Peril? A Natural Gas Energy Future: Promise or Peril? My own opinions on natural gas have changed fairly significantly this year. For my whole life (and without putting much thought or research into it), I have always viewed natural gas as a bridge fuel: a more environmentally sustainable alternative to fossil fuels until a transition can be made to renewable sources. While I truly don’t know what gave me this opinion, I assume it comes from the generally established reputation natural gas has as being cleaner than other fossil fuels, and possibly even just the fact that natural is in the name. Then, in my Environmental Studies class, I watched the documentary Gasland (linked to below), which completely switched my view; knowing more about the dangers of fracking has made me feel as if, when considered as a whole (that is both the fracking for extraction and burning as a fuel), natural gas has no more of a claim to the world’s energy future then other fossil fuels. Through the audio clips and analysis of interviews I did with a variety of sources, as well as the writing and visual elements of this page, I hope to explain why I feel this way and bring others to reach the same conclusion. So… What is Natural Gas? And What is Fracking? To quote the United States Government Energy Information Agency (EIA), “Natural gas occurs deep beneath the earth’s surface. Natural gas consists mainly of methane, a compound with one carbon atom and four hydrogen atoms. Natural gas also contains small amounts of hydrocarbon gas liquids and non-hydrocarbon gases. We use natural gas as a fuel and to make materials and chemicals.” Much like oil, coal, and petroleum, it is formed when immense amounts of time, heat and pressure turn the decayed remains of ancient plants and animals into one of these forms of fuel. Another form, shale gas, occurs in small spaces within the shale itself. Currently, the US gets 29% of its energy from natural gas, which is second only to petroleum, from which we get 37%. The US is the world’s number one producer and consumer of Natural Gas, producing over 100 Mtoe (Million Tonnes of Oil Equivalent) more than the next highest (Russia) and consuming almost twice as much (635.86 Mtoe vs 365.96). While we have always consumed and produced the most natural gas in the world, what is striking is how much the prevalence of natural gas globally has increased in recent years. According to the International Energy Agency (IEA) in 1973, the US consumed 509.99 Mtoe of natural gas. In 2015, This number increased to 635.86. However, in that same time, the amount consumed by the second biggest consumer (Canada in 1973 and Russia in 2015) increased from 35.34 Mtoe to 365.96 Mtoe. In 2015, 22 countries consumed more natural gas then Canada did in 1973. Hydraulic fracturing, or fracking, is the process generally used to extract natural gas. Effectively, it works by pumping extremely high pressured water mixed with sand and some other chemicals into a well dug about 1 to 2 miles into the ground. This fractures (hence the name) the surrounding rock, allowing for easier access to the gas in that shale formation. Fracking is a very controversial method because it releases chemicals into the ground, can contaminate water tables, and lead to ground instability, but it makes the gas much cheaper and easier to extract (see arguments for and against natural gas). The majority of the arguments for natural gas focus on natural gas in comparison to other fossil fuels, hence the common notion of it being a “bridge” fuel. 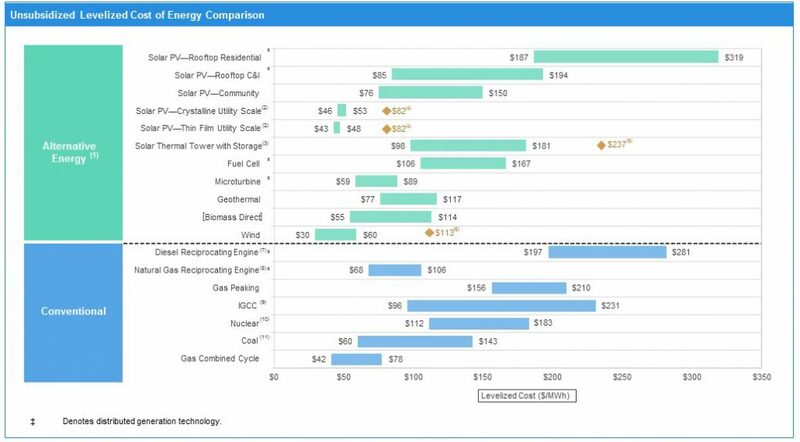 Most notably, while different sources give different numbers for cost, it is generally considered to be a fairly cheap energy source (see chart below). Additionally, it burns much cleaner than either coal or oil, releasing roughly 45% less CO2 then coal and 30% less than oil. Natural gas is also naturally abundant in many countries (including the US), so using it allows these countries to be more energy independent and therefore rely less on foreign oil for their energy needs. Finally, as a large source of our current energy consumption, the natural gas industry is a significant source of jobs, and the infrastructure for its use is already in place. The majority of the arguments against natural gas come from the process used to retrieve it, fracking. This releases many chemicals into the ground, and by law it is not required for these to be disclosed. This process often leads to gas and/or chemical leaks, which can pollute water supplies and is the cause of the famous image from Gasland of water coming out of a faucet that and being lit on fire. Also, by creating small cracks in the underground rocks, the ground in the areas where fracking occurs can lose stability. Finally, fracking often leads to methane leaks. According to a study by Cornell faculty members, because methane is a more potent greenhouse gas then CO2 natural gas actually has more of an impact on global warming than coal does. In addition to fracking, much like other fossil fuels, natural gas is a non-renewable source of energy that takes millions of years to create. And, while it does burn cleaner then coal and oil, it still releases large amounts of CO2 and other greenhouse gases, namely methane. Additionally, even if it is produced domestically, it still requires significant amounts of transportation. For this project, I also interviewed a range of people with the hopes of getting a variety of opinions to portray. Among those I interviewed were Matt Turnbull, who teaches history and environmental studies at BB&N, Jen Snyder, who has worked as a consultant at North American Natural Gas for about 20 years, and various BB&N students who didn’t know too much about natural gas. For the interviews with the students, the questions I asked were the same as in the survey I sent out to the school (and the one at the start of this page), with the only additions being why they had this opinion and how much prior knowledge they had. Not all of each interview is included here. Richard Kennedy is another person I had an interview scheduled with who works with natural gas (he worked for Spectra Energy (now called Enbridge), a “pipe line company that mostly transports Natural Gas from harvest to storage and then to market,” for 18 years. While scheduling issues meant that our interview never took place, he did send me these 5 articles which offer a completely different perspective on natural gas. Over the course of the research for this project, the viewpoint given to me by Gasland was continually solidified. The majority of the sources I found showed that natural gas and fracking have worse side effects than much of the public (and certainly the people I interviewed, many of whom treated it as fact that natural gas was cleaner than other fossil fuels) perceives. As mentioned in the “arguments for” section, at face value this is correct: natural gas releases less CO2 then other fossil fuels and has minimal to no byproducts. What this doesn’t take into account is fracking, which in my mind has enough negatives to outweigh the advantages of natural gas. Even when done correctly (which it often isn’t), there are so many inherent risks associated with fracking that the environmental impact of natural gas is drastically increased. Of course, this doesn’t mean we should immediately stop all use of natural gas, or that we should favor using other fossil fuels over it. What it does mean is that, in my opinion, natural gas is just as bad as other fossil fuels. Therefore, I disagree with the idea of natural gas as a “bridge fuel”—rather, we should be trying to reduce use of it just as much as we do use of coal, oil, and petroleum. So, what can be done about this? How can we move away from natural gas? On an individual level, the actions to take are in many ways the same one would do to reduce their carbon footprint in general—be conscious about where your energy is sourced from, cost and location permitting install solar panels and windmills, turn out lights, unplug chargers, don’t use heat or air conditioning when you are not home, etc.. The tricky part about natural gas is that when considering where their energy comes from people view it as a better option then other fossil fuels. So how can we reduce use of it in particular, or at least slow the massive growth it has had in recent years? A simple solution is a letter or email sent to a local representative. Keep it clear and concise, and explain your view: (if you agree with me) that the environmental ramifications of natural gas, and fracking in particular, significantly outweigh the economic advantages. Another easy option is simply to engage in debates and/or educate your family and friends; many people simply aren’t educated about natural gas, especially given its importance in the world’s economy. Show them this presentation, or your own personal research. Explain the cons, many of which most people simply don’t realize. Have a community showing of Gasland (linked to below), a compelling documentary that does a good job focusing the argument. Or just watch the documentary yourself, or show it to your friends and family. There are so many options, so the important thing is just that you do something. And here is a link to the whole movie for those interested. “Hydraulic Fracturing and Induced Seismicity.” USGS: Energy Resources Program. Accessed April 19, 2018. https://energy.usgs.gov/OilGas/UnconventionalOilGas/HydraulicFracturing.aspx#3892235-overview. Lieberman, Bruce. “Pros and Cons: Promise, Pitfalls of Natural Gas.” Yale Climate Connections. July 07, 2016. Accessed April 18, 2018. https://www.yaleclimateconnections.org/2016/07/pros-and-cons-the-promise-and-pitfalls-of-natural-gas/. “Natural Gas – Energy Explained, Your Guide To Understanding Energy – Energy Information Administration.” Energy Information Administration. October 25, 2017. Accessed April 17, 2018. https://www.eia.gov/energyexplained/index.cfm?page=natural_gas_home. Shackford, Stacey. “Natural Gas From Fracking Could Be ‘Dirtier’ Than Coal, Cornell Professors Find.” Cornell Chronicle. April 11, 2011. Accessed April 19, 2018. http://news.cornell.edu/stories/2011/04/fracking-leaks-may-make-gas-dirtier-coal. “Short Term Energy Outlook.” U.S. Energy Information Administration. April 10, 2018. Accessed April 19, 2018. https://www.eia.gov/outlooks/steo/report/prices.php. Siegel, RP. “Natural Gas: Pros and Cons.” Triple Pundit. April 3, 2012. Accessed April 17, 2018. https://www.triplepundit.com/special/energy-options-pros-and-cons/natural-gas-pros-cons/. Nice work on this, Ben! I enjoyed reading your catalyst page because it was authentic and informative. I especially liked how you provided ways for individuals to get involved. Well done! Though you make your perspective clear from the beginning, I appreciate the way this page addresses both the pluses and minuses of natural gas as an energy source. Your conclusions are persuasive! One feature that really spoke to me: the short interviews with classmates and others kind of stand in for the audience–they made me feel better about not knowing as much as I should about this topic.